Piano Garden Rose is a medium sized, dark red on the outside, with lighter reds on the inside. It opens beautifully into a perfect deep cup and lasts a long time in the vase. 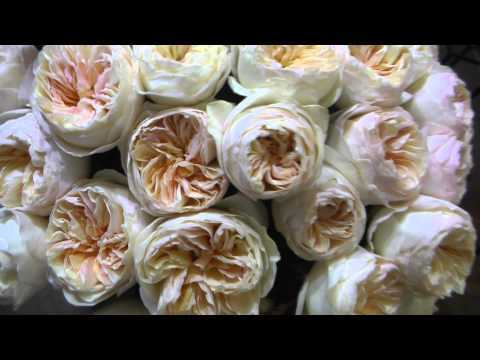 Garden roses have characteristically full and open flower heads and swirled petal structure. Piano emits a low fragrance, and looks great in vase work. Can be used alone for traditional hand-tied bouquets and also mix beautifully with other wedding flowers in mixed bouquets and arrangements. If you are ordering garden roses for a wedding or event, we recommend that you select a delivery date that is 3 to 4 days before the event date. For example, for a wedding on a Saturday, your flowers should be delivered on the Tuesday or Wednesday beforehand. This is to give your flowers enough time to rehydrate and fully open.